Of all the Spanish cities that we have visited, Toledo is one of our favourites. Toledo is both the capital of the province of the same name and the capital of the region of Castilla La Mancha. It is located 70km south of Madrid and although its a small city, its an important political and cultural centre. The city has a wealth of history and a wide array of architectural treasures. The city is based on the banks of the Tagus River which you will cross as you enter the city by means of an impressive bridge. The bridge into Toledo was originally built by the Romans, it was later extended and enlarged by the Arabs. A large reservoir was built to supply Toledo with fresh water. The dam for this is still visible around 35km away. At around 480m long, it's one of the largest reservoirs in the area. You will enter the city centre by means of one of the huge stone gateways. Nothing remains of the Bab Tafalin Gate which was the Gate of the Clay Sellers. However, the Old Bisagra Gate remains pretty much as it was built. This gate was probably the main gate to the city at one time. The Bab al Mardum Gate is an Arab construction that has been re-modelled. The original horseshoe arch has been rebuilt in a semi-pointed style. The small Mosque can be seen on the inner side of the gate. This Mosque is quite unique as it is very small for a Mosque and does not conform to the conventional layout. The Puerta del Sol (Sun Gate) was built to accommodate wagons between 1375 and 1399. It is said to be the finest Mudejar style gate in the whole of Spain. Other gates include the Cambron Gate, which has been identified as the Gate of the Jews (Bab al Yahud). This gate was remodelled in the 16th century, with two towers being added, forming an inner courtyard. It is impossible to walk the streets without coming across an important building and we couldn't possibly write about them all on this one page. When you arrive in the city, you will find car parking a problem. Don't even think about taking your car into the historic centre. You should make your way to the Cathedral first, right in the centre for this is where you will find the tourist office who will give you a handful of information and a street plan. The Cathedral (right) is described as one of the most extraordinary in Spain. Construction was begun in 1226 but it took 300 years to build. The result is a mainly Gothic style building but showing a multitude of influences. Make sure that you walk all the way round and examine all four sides as each is very different. If you have time, take a tour of the museum inside where you will see a multitude of Spain's most precious paintings and the Cathedral treasure. Opposite the Cathedral is the Town Hall (right), beneath which is the tourist office. The building is of Renaissance style with two towers with Baroque spires. Close by is the Convent of Santa Isabel de los Reyes, dating from 1477, the church is usually open all year round and contains two palaces. The Church of San Juan de los Reyes is another building worthy of a visit. The church stands in the Jewish quarter and has a stunning octagonal dome. It dates from 1476. At the time of the foundation of the castle by Alfonso VI, this castle served as a monastery for monks of the Clunic order. It was later used by the Templar Knights. The castle has suffered much damage over the years but was restored in 1949. It then became a college but is now a youth hostel. The castle (pic below right) stands on the opposite side of the river. Toledo is home to the El Greco House Museum, an elegant building dedicated to the life of the celebrated painter. One of the most famous names of Toledo is El Greco whose works are everywhere. The Casa Museo de El Greco is located in C/Samuel Levi, Tel Nº 925 224 046. The Museum of Modern Art is located in a specially converted Toledan house called the House of Chains. The museum houses a fine collection of works including paintings, bronzes and sketches. The Museum of the Duchess of Lerma is located in the Hospital de Cardinal Tavera building. The museum has a perfectly preserved infirmary with some very rare exhibits. The Duchess took up residence in the hospital and brought with her, a superb collection of artwork which is now on display here. Toledo is an easy excursion from Madrid, by coach or train. You must explore the city by foot and most places of interest are within easy walking distance. Wear suitable footwear as most of the roads are cobbled and walking can be tedious. The city offers ample accommodation of all grades and there is a wide selection of bars and restaurants. The city can become very crowded in the summer and can be very cold in the winter. If you do take your car, be careful where you park. Street parking is controlled by meters and traffic wardens are keen. Just outside the city walls you can visit the remains of a Roman circus (right). In the garden area near the Hospital de Tavera you will see what was once one of the largest in the Roman Empire and closest to the Circus Maximus in Rome which signifies the importance of Toledo in ancient times. The circus had a capacity for 25,000 spectators and was 425 metres long. Many of the houses in this quarter are built over Roman foundations. 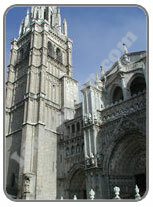 Toledo has its own specialities on offer for the tourist and there is a massive craft movement in the city. 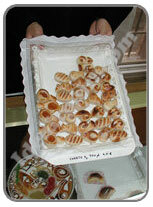 The city is famous for the production of marzipan, often moulded into little sweets of various shapes and sizes. Pictured below is a selection in a small shop. Other local crafts include top quality lace ware and Toledo jewellery. Pictured below is a selection of swords for which Toledo is famous. Shops on every corner have hundreds to choose from. Toledo is not a popular place for vegetarians; it is indeed serious hunting territory, with venison, partridge and wild boar on most menus. Toledo does however have a massive selection of restaurants to choose from, ranging from basic snacks to full, expensive meals.